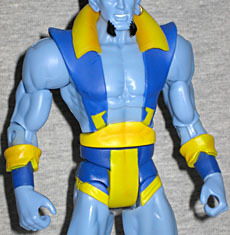 While working on an action film near ancient ruins, Daniel Cassidy was fused to his Blue Devil costume by an archdemon named Nebiros. Danny made the best of it and became a crime fighter. Then a deal with the demon Neron went sour and Cassidy was killed, only to be resurrected as an actual devil. Danny uses his abilities to rid the world of supernatural threats with the super-powered team Shadowpact. When Blue Devil premiered in his own comic in 1984, he was a conscious effort to put the "comic" back in "comicbooks." He was intended to be a humorous, light-hearted character who crazy things happened to. He wasn't as zany as Plastic Man, but he wasn't as "realistic" as the rest of DC's line. Think more JLI than JLA. Unfortunately, when his book ended he became just another supporting character in the DCU, and other writers were free to do whatever they wanted with him - that included him trading his soul to Neron and becoming a real demon. Yeah. That's (partially) been undone now, thank goodness. Change for the sake of change never works out. Blue Devil gets a lot of new pieces. Obviously the torso is new, with its fancy vest thing - those pointy shoulders and that disco collar can't be copied from anyone else. But his forearms and shins are original, too: we've had plenty of other characters with similarly folded gloves and boots, but none of those have had the small triangular cutouts along the edges that BD's have. The figure doesn't have a tail, but other than being animated on JLU, the character never has; you may think it's a mistake, but nope! The figure has a nice face, but... You know, Poe once mentioned that the Four Horsemen create great likenesses, making each figure distinct without basing them on real people. Well, it's time to rewrite that review, because Blue Devil's face is just straight up Nicolas Cage. The proportions, the expression... it's young Nick Cage, plucked from somewhere between Raising Arizona and Guarding Tess. Seriously, just look at the eyebrows, the shape of the nose or that dopey grin. You can never un-see it. For the most part, paint is good, but there are a few uneven spots, and some issues that are unavoidable due to the realities of making a physical figure. The small things are the border between his legs and his boots, where the pale blue and yellow get a little sloppy; and the yellow on his trunks, which needs another coat or to to keep the blue from showing through. The insurmountable issue is that all the yellow on his pants should look like one unbroken shape, but the necessity of joints keeps that from happening: the shadows deep inside the joints create black lines that stand out too hard against the yellow. Oh, and if you want to nit-pick, the back of his trunks is all wrong: there should be no "horns" on the small of his back, and no matching yellow stripe below. They've also changed the way his vest tucks into the belt, but that's to accommodate the joint, so we can forgive that. Blue Devil's only accessory is his trident. This is the original version, which was designed as part of the costume (these days he's using a real one he got from a demon). It had rocket boosters, allowing him to fly, as well as a few other built-in technological tricks. The piece is 7½" tall, and looks great in the figure's hands. Blue Devil includes one of the DC 75th Anniversary collector buttons that all the DCU and Infinite Heroes figures come with this year. His isn't comic art, though; rather, the bland, static pose reveals it as coming from the Warner Brothers Consumer Products control art - those cut-and-paste figures are the same ones used on the edges of the DCU cards. 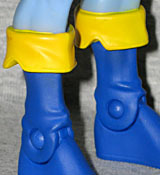 We also get a BAF piece with Blue Devil, Trigon's torso. 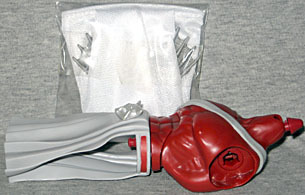 It's a big red piece with a white sash sculpted around the chest, and a matching loincloth with a silver skull buckle. There's a notch in the back where the big guy's cape will be attached. The cape is also included, folded up nicely in a little baggie. 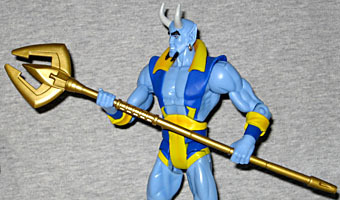 Blue Devil is not one of the fastest sellers of DCU13, but he is a good toy with a surprising amount of new sculpt. This is the first series in a while to reach retail shelves in any kind of numbers, so you can go to Wal*Mart right now and pick one up. After all, when else are you going to get a blue Nicolas Cage with horns on his head?